Finances tailored like a suit. Building a brand based on trust. Private Finance Partners are financial advisors and wealth managers offering a bespoke service for high net worth clients. In a time where financial advisors are suffering from trust issues and a bad reputation, their approach is built on long term relationships, honesty and fully personalised best in class advice. While their business model was truly outstanding, their branding fulfilled every classic finance cliché and did not by any means help them to tell their unique story. We built the brand based on the brand idea 'Finances tailored like a suit', re-imagining the visual qualities of a traditional bespoke tailor. The brand design is an eclectic mix of elements combining a simplistic wordmark with a classic monogram, haptic stocks and premium finishes. 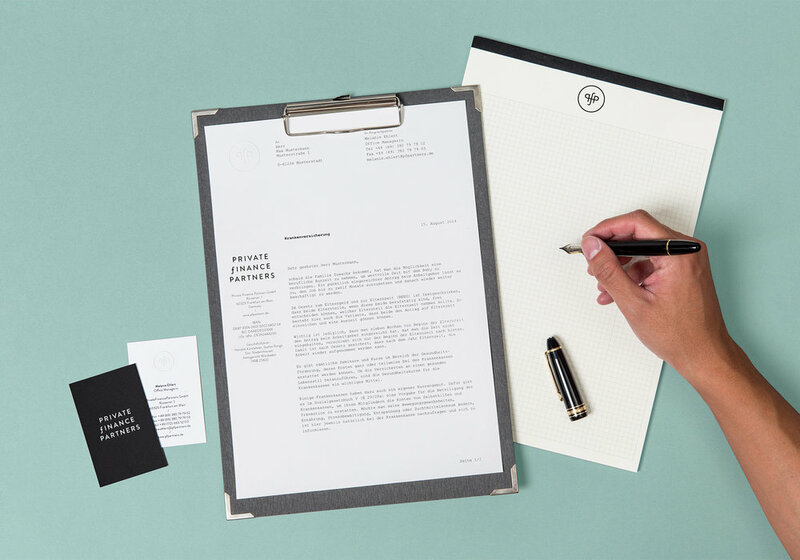 The stationery’s handmade appeal creates a warm and contemporary brand reminiscent of a time when the quality of personal service was ubiquitous.